Nowadays, the Popping Stone is a group of three rounded sandstone boulders in the bed of the Irthing Gorge, near Gilsland. It lies within the extensive grounds of the Gilsland Spa Hotel on the Cumbrian or west bank of the River Irthing, which here defines the county boundary. The Popping Stone is marked on the 1:25,000 and 1:50,000 Ordnance Survey maps and can be reached by footpaths, although the last section can be boggy in wet weather. The hotel welcomes the use of its large car park and the enjoyment of the wooded grounds by visitors, particularly if they decide to take advantage of the excellent hospitality available. The secluded site is at the northern end of a 250m-long riverside meadow or haugh stretching northwards from the Popping Stone Footbridge. Just upstream from the stone the river bank merges with a cliff and becomes impassable except by wading. The river curves to the west along this stretch, the result being that the Popping Stone is invisible from vantage points along the eastern cliff tops where the hotel is situated, making it an ideal destination for courting couples staying at the The Shaws or Wardrew House. The name of the stone may be derived from the Old English word popelstan, meaning "pebble-stone" (Ekwall, 1960). The OED also offers the word "popple", of similar origin, which can mean boiling or bulging. Popple is also a name for Poplar and Aspen trees, a dialect word in the UK, but apparently in fairly common current use in the USa . Scott refers to the meeting place of Lucy and her lover (see below) as "our poplar bower". I think the traditions still associated with the Popping Stone may be evidence for its importance in the past as a focus for rituals or myths involving fertility and courtship. I suggest that it is an unusual type of megalithic monument and should be officially recognised as a potential ancient site. It is difficult to support these opinions with evidence at present, due to the almost total absence of historical sources or archaeological investigation, but available material raises some interesting questions. The Popping Stone and its daughters are rounded boulders of coarse sandstone. Sources of such stone are abundant in the in the Carboniferous Upper Border Group of strata which outcrops along the upper reaches of the Irthing. Two sub-units of this group, the Poppingstone Sandstone and the Crammel Linn Sandstone form the cliffs above and immediately upstream of the Popping Stone (Day, 1970). These sandstones are characterised as "massive" and numerous other very large boulders are scattered around the site, having presumably fallen from the cliffs above, but all are strikingly sharp-edged and angular compared to the rounded and moulded areas of the Popping Stone. The rounded shape of the present-day Popping Stone is, I believe, due to deliberate shaping (see below) and not to any geological process, but the rounded areas on the original stone may be consistent with its having been present in the river bed for thousands of years. Its great size would make it resistant to being moved or broken up by extreme flooding events, and in the past the river probably flowed at a higher level, running over the stone to produce the shapes seen in the 1860s photographs. The Popping Stone was not always the shape we see today. The change in shape is acknowledged in some later publications, though generally asserted to be a result of people chipping pieces off for their magical properties. It would take a long time for such activity to alter the shape as drastically as is evident, and the change does not take place gradually, all photos are either one shape or the other. An old postcard, circulating around 1907-8, shows the original shape, with figures in Victorian costume. Although probably derived from a photograph this image is heavily altered and on its own would be an unreliable guide, but I have also been able to find several more 1860s photographs showing the same original shape. These photographs show that it must have been dramatically altered during the 1870s, probably in the earlier part of the decade, co-inciding with the death in 1869 of John Gelderd, proprietor of the hotel and its take-over by his son James with two business partners; the Scott Centenary celebrations (1872), and the death of G.G. Mounsey, the owner of Gilsland Spa estate (1874). Each of these events, separately or in combination, must have invited a fresh look at the management of the hotel and the promotion of its assets. "Sir Walter Scott was in early life an occasional resident at Gilsland. The broad, flat stone is pointed out, a little above the Shaws Hotel, on which tradition asserts he was standing when he declared to the subsequent lady Scott the emotions which agitated his bosom. He had therefore the opportunity of becoming aquainted with the district and its traditions." The footnote begins with a quotation from Hodgson (1840) and it is not entirely clear whether the above passage is also from this source, but I have been unable to find it in the original. It is interesting that even at this early date the legend is more prominent than an accurate description of the stone. a guidebook published by Mason’s of Carlisle for James Gelderd, proprietor of The Shaws, around 1869. These dates are 60-70 years after the proposal, and 20-30 years after Scott’s death, yet the legend connecting Scott’s wooing and the naming of the stone materialises soon after this time. (b) circumspect to the point of incomprehensibility, (especially Arthur's), reinforcing my opinion that those earlier writers who actually visited the Spa probably did hear about the Popping Stone but considered the folklore associated with it too vulgar for the book-buying classes. Before the 1860s virtually every publication on Gilsland seems to studiously ignore the Popping Stone (see below), after this time almost every one repeats or elaborates the standard myth. It has become almost de rigeur among local historians to repeat that "Sir" Walter Scott "popped the question" at the then unnamed stone which was "for ever afterwards" known as the Popping Stone. Although it is obvious why the original legend needed to be elaborated ( "That Walter Scott proposed here, y'know"; "Oh yeah ? "), the continued uncritical repetition of this piece of Victorian promoter's tittle-tattle merely cheapens Gilsland's most powerful and mysterious relic. Walter Scott (later Sir Walter) proposed to Miss Charpentier or Carpenter during "the season" of 1797 and married her on the 24th of December of that year at St Mary's, Carlisle, although the reason for Scott's haste in marrying and the trouble he had persuading his parents to accept Charlotte's bona fides unfortunately sully the "happy ever after" presentation of his courtship. At the time he was 26, a newly qualified Edinburgh lawyer who had only one piece of creative writing to his name, a translation of obscure German poetry which he published anonymously (Bürger, 1796). It is difficult to understand why anyone outside his immediate family would be interested in the precise location of this young man’s proposal, or even that he had proposed at all. More to the point, why did he take the trouble to march Miss Carpenter all the way the Popping Stone if it wasn’t already locally famous (or, more likely, infamous) as a rendezvous for lovers? Jollie’s 1804 "Guide to Gilsland" doesn’t mention the stone. W. Reid Clanny's 1816 "Treatise on the Mineral Waters of Gilsland" describes many of the natural and historical features of interest in the area – but not the Popping Stone. In 1836 William Steele published a book subtitled "a Sketch of the Most Remarkable Objects Near Gilsland Spa ". If the Popping Stone was going to be mentioned anywhere, surely it would be here ? Not a peep. 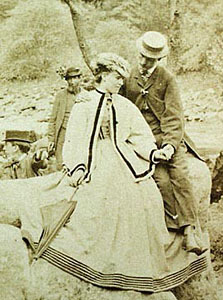 George Mounsey, owner and re-builder of the Shaws Hotel doesn't mention it in his exhaustive history of the spa , published around 1865, although John Lee's dated photograph shows that the Popping Stone was named and was "the" place to photograph your womenfolk at this time, with a beaten path plainly visible in the lower left of the photo. The quote from W. Collingwood Bruce and the article in the Carlisle Journal (both above) also demonstrate that the link with Scott was firmly established at this time and Mounsey discusses Scott's visit and courtship. Older biographies of Scott are equally silent on the subject. For instance, the Life of Sir Walter Scott; published by his son-in-law and "literary executor" (Lockhart, 1842) deals exhaustively with his courtship of Miss Carpenter but doesn't mention the Popping Stone. Who would not that their love be seen." (From the introduction to "The Bridal"
I think it is quite plausible that Scott did take his girlfriend to the Popping Stone, and he may well have popped the question there. His fascination with local folklore and legend would have made it irresistible if it was already noteworthy at the time. The fact that the stone and its folklore do not feature in his writings (apart from the putative encoded account in The Bridal) suggests, perhaps, that the traditions were too saucy and the story of his visit must have been revealed through later personal anecdote or the reminiscences of friends. It is also worth remembering that tracing and visiting the settings of Scott's novels and ballads became popular during the 19th century and the Gilslanders' memories of Scott and his adventures may have been "discovered" as a consequence of this effort. Once out, the tale was probably elaborated and nurtured in Gilsland, perhaps as a popular response to Scott’s increasing fame, and subsequently promoted as a cynical piece of PR by those interested in developing tourism in the area (obviously, nothing similar could happen in these enlightened times). I think the Stone may have required remodelling at this point to erase folklore rituals and prevent offence if it was to be promoted by a respectable hotelier, or may have been disintegrating and required "tidying" - or maybe its size made mounting (the stone) difficult in a crinoline. The country-wide celebrations for the Scott centenary in 1872 are especially significant in respect of a reshaping close to this date. The Popping Stone's true origins may be impossible to uncover, but it seems unlikely that it is only a Victorian folly. Gilsland Spa Hotel - Round off your visit to the Popping Stone with a drink or a meal.